Civil War Currier + Ives Hand-Colored Lithograph. 1861 Civil War Currier & Ives Hand-Colored Lithograph. 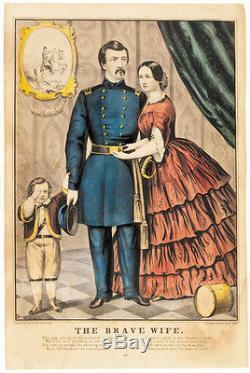 1861-Dated Civil War Period, Currier & Ives, Hand-Colored Lithograph entitled, The Brace Wife, of Civil War General George McClellan and Family, Very Fine. This original, highly colorful lithograph measures 9.25 x 14 and it does not specifically identify the Civil War officer pictured as being Union Major General McClellan, but it is very obviously him. On the wall behind McClellan is a portrait of a Union Officer on a white horse leading a charge into battle. Below the image area is an eight line poem extolling the sorrows of the wife of a Soldier. This original lithograph is in very good condition and displays nicely a the original, hand coloring is bright. The sheet itself is uniformly age toned and has some light water staining seen more prominently on the blank reverse and there is no repairs. A scarce Civil War period Currier & Ives print. VIEW Other Items offered by Early_American_Auctions. Complete Table of Contents, Current Offerings and Additional Images can be found at Early American History Auctions online Over 1,000 items currently online! The item "Civil War Currier + Ives Hand-Colored Lithograph" is in sale since Wednesday, February 20, 2013. This item is in the category "Collectibles\Militaria\Civil War (1861-65)\Original Period Items\Posters & Prints". The seller is "early_american_auctions" and is located in Rancho Santa Fe, California.